Whether visiting Linetec in-person at the American Institute of Architects (AIA) Expo booth #1143, or visiting online at its Architectural Resource Center, architects are welcome to "Select and Spec" samples of anodize and painted finishes. Visitors to the AIA booth are invited to browse the Select and Spec display, and to take pocket-sized aluminum samples with them. From its 30,000 in-house blendable paint colors and anodize coatings, Linetec has selected 24 paint colors on individual "chips," plus anodize sample rings with eight chips including its no-patina copper. 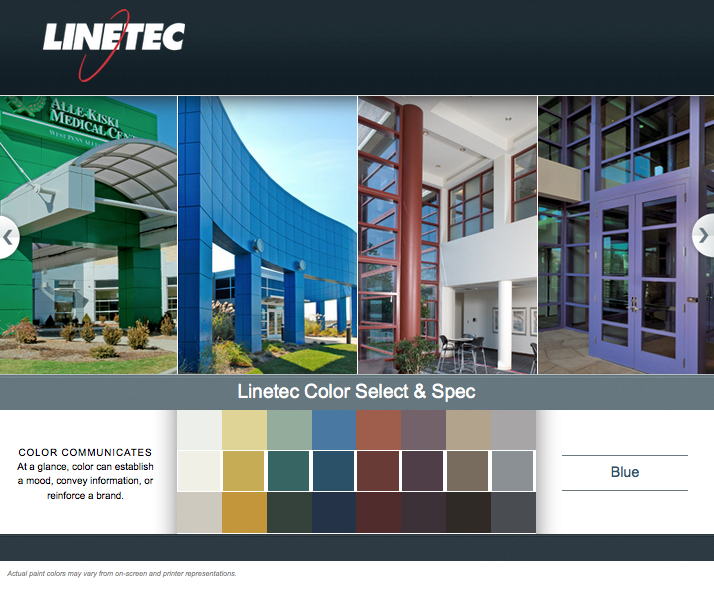 Linetec's online Select and Spec tool allows visitors to browse its vast color palettes and order painted aluminum samples. Organized into eight color families with interactive chips, the user clicks on a chip to see a larger image and orders up to five samples. These 3.5-by-2-inch painted metal samples are mailed to the contact information provided by the user. Each of Linetec's Select and Spec samples is labeled with an "LT" paint code for reference when specifying the finish for future architectural projects. Linetec's online Architectural Resource Center also includes on-demand continuing education courses and tools for simplifying coatings selection and specification. As a registered AIA Continuing Education System (AIA/CES) provider, Linetec offers "Introduction to Coatings: Field Performance and the Application Process" and "Choosing Sustainable Finishes." Participants can earn 2.0 Learning Units (LUs) for successfully completing both courses. These programs are available as either an in-person presentation or as a self-guided online course.